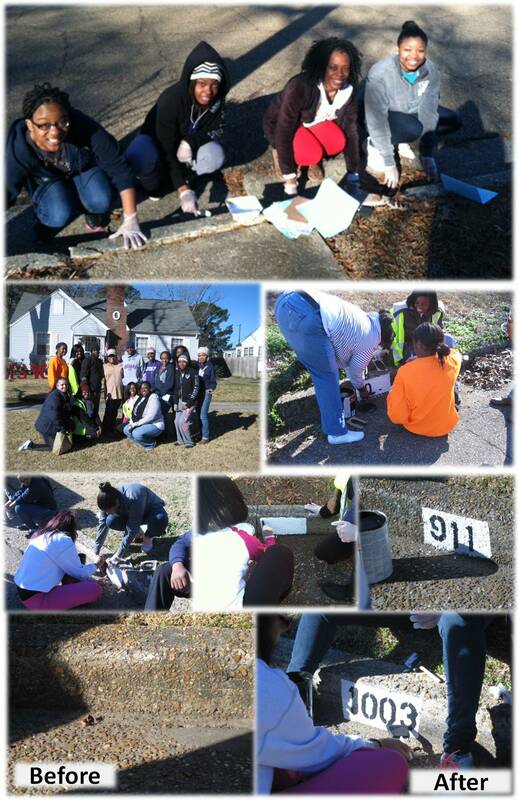 On yesterday, dozens of volunteers showed up to do community service in rememberance of Martin Luther King Jr. There were several projects scheduled through out the City of Jackson which included planting flowers at the Jackson Zoo, cleaning up Terry Road, and mowing vacant lots. In West Jackson, dozens of JSU students showed up to help paint house numbers on the curb of streets. Students gathered in front of the Athletic and Assembly Center at eight o’clock. They were divided up in four different teams and each team targeted certain streets. The students took the supplies and walked to homes in Washington Addition, Pecan Park, Poindexter Park, and University Park. At the end of the day, students had painted house numbers for twenty-five homes. The residents in West Jackson enjoyed interacting with JSU students and were extremely happy to see them working in their community. This project was a collaboration between the City of Jackson, Alice Varnado Harden Center for Service and Community Engaged Learning, and the Center for University-Based Development. If you are interested in having your house number painted on your street curb, contact 601-979-5828. JSU students will pick another day to complete more homes in the future.